Bandit. Games room. Saturday night karaoke with him who was once on Stars In Their Eyes. You’d need to tick at least one of those boxes where I’m from if you’re going to call yourself a Pub; the ‘Grub’ bit generally being a peripheral concern. Not at Tom Kitchin’s Scran and Scallie “gastropub” though, where – let’s be honest, TK – it’s less of the “Public House” and more of the “with dining”. That’s not to say you can’t rock up and bend your elbow over a few pints here, but on the Tuesday night of this visit the clutch of stools at the narrow bar were arse-free, while the chairs in the eaty part – about 98.5% of the space remaining – were completely arse-full. And why wouldn’t they be? What the Scran and Scallie might lack in yer sticky carpeted, nicotine ceilinged, wall-to-wall Sky Sports trad pub chic it makes up for in its big-plated, elbows-on-the-table canon of classic scoff. 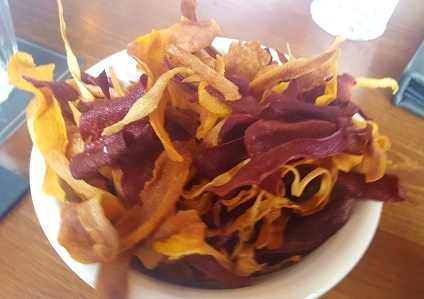 There’s a parfait, of course, fluffy as Chambourcy chocolate mousse, which comes after we’ve blitzed through a bowl of on-the-house homemade vegetable crisps. I mean, we all know there’s no greater crisp than the Pickled Onion Monster Munch, but still, nice touch. 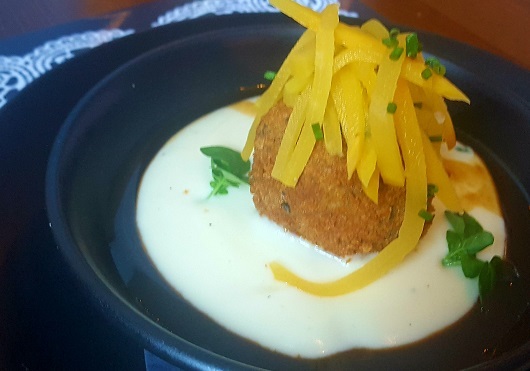 An orb of offaly haggis – I know, clock us tourists – comes with a can’t-put-my-finger-on-it ‘sauce’; potato veloute I reckon, smartly ticking the ‘tatties’ element while strands of swede – soz, ‘turnip’, soz, ‘neeps’ – complete the age-old ensemble. 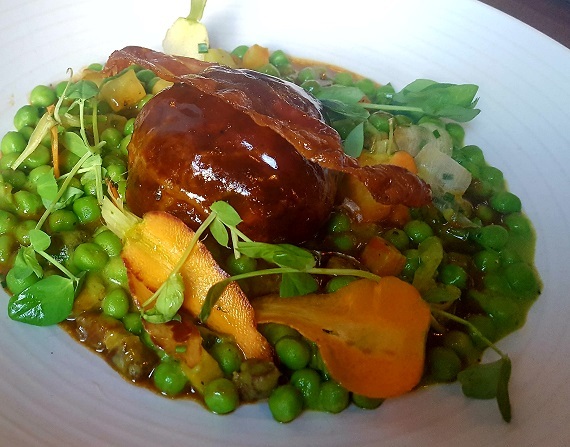 There’s a lump of lamb, slow-cooked and slathered in a much reduced shimmering gravy – they’re good at sauces here – bolstered by proper garden peas and carrots. 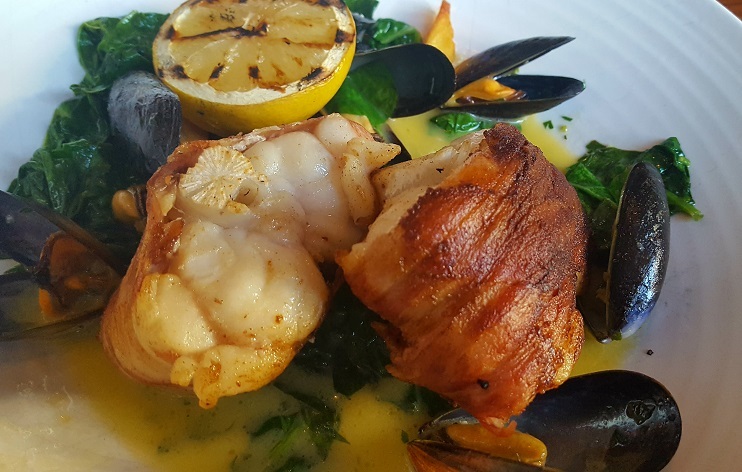 Two slabs of pearly monkfish land with a heady whiff of the sea and a handful of the musseliest of mussels that, according to ebullient gaffer Robert, had arrived at the door about 4 hours before us. Yes, I am that prick who asks those questions. At just under 25 quid it’s not cheap, but given the quality of the bits and pieces on the plate goes down as sound value to me. There’s plenty to go at in the lower gears though: a boulder of a burger for example, or the ham/egg/chips holy trinity are both a tenner cheaper, plus there’s a ‘grain salad’ knocking about for people who don’t like food. Our maiden trip to E’burg a couple of years ago had us going gullet deep on the tasting menu down the road at the Michelin-anointed mothership, and it was a corker. But, while we established long ago that I know nothing, I can’t see a world of difference in the cooking at The Kitchin compared to the cooking here. Bit more delicate and refined at the other gaff, hence the Star, but the Scran and Scallie’s hardly a Harvesters, and this is by no means your entry level pub grub. Plus, you can order chips here so it’s possibly the one I’d be most tempted to revisit. Booze: £5.50 for a pint of keg: not too bad for the stronger stuff, but steep for a lager. £4.80 for a pint of cask. Wines start at £22.50/btl with the majority also temptingly available by the 500ml.